This chicken stew is a dish that I’ve been making for years without following a recipe, just the way I grew up cooking it. Just add a little bit of this, a pinch of that, and taste to check if it needs something else. It is so versatile and at the same time so forgiving because you can add other vegetables, and even though you don’t have all the seasonings, the stew will come out wonderful. 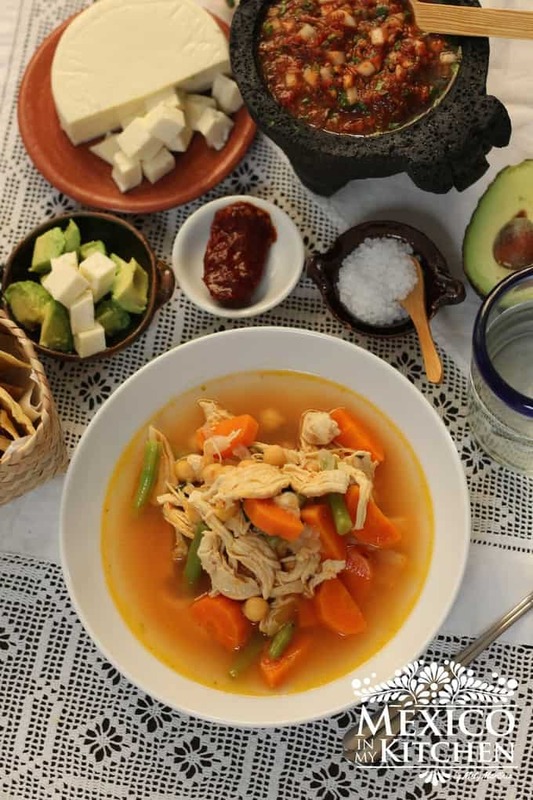 I call it Veracruz Style because the basic ingredients are similar to those of the Red Snapper Veracruz Style Stew, but using chicken instead of fish. But many know this dish as “Chicken Stew” (estofado de pollo) or “chicken in tomato sauce”, and it is also similar to other recipes from Europe like chicken fricassee and chicken marengo. Veracruz is a state whose gastronomy is influenced by Spain, the many other European and African foreigners that arrived in Colonial times, and the Gulf of Mexico. This complex mix rendered one of the richest cuisines in the country, where the local cooks combine all that historical background into their dishes, creating mouth-watering meals like this chicken stew. Add the chicken to frying pan to sear for about 7-8 minutes per side. Once the chicken is browned remove from pan and keep warm. Add onion and cook for about 2 minutes. Stir in the garlic and carrots and cook for 5 minutes before adding the potatoes. Cook the vegetables 2 more minutes after adding the potatoes. Place chopped tomatoes and cup of water into a blender and process until smooth. Pour tomato mixture to the frying pan using a colander or sieve. Add the chicken; bring to a boil and then lower the heat to simmer. Add bay leaves, thyme, marjoram, olives, raisins, and capers. Season with salt and pepper and cover. Simmer until chicken and vegetables are cooked. The cooking time will vary depending on the size and type of chicken pieces. Serve with rice and pickled jalapeño peppers. This chicken stew is a dish that I’ve been making for years without following a recipe, just the way I grew up cooking it. Just add a little bit of this, a pinch of that, and taste to check if it needs something else. 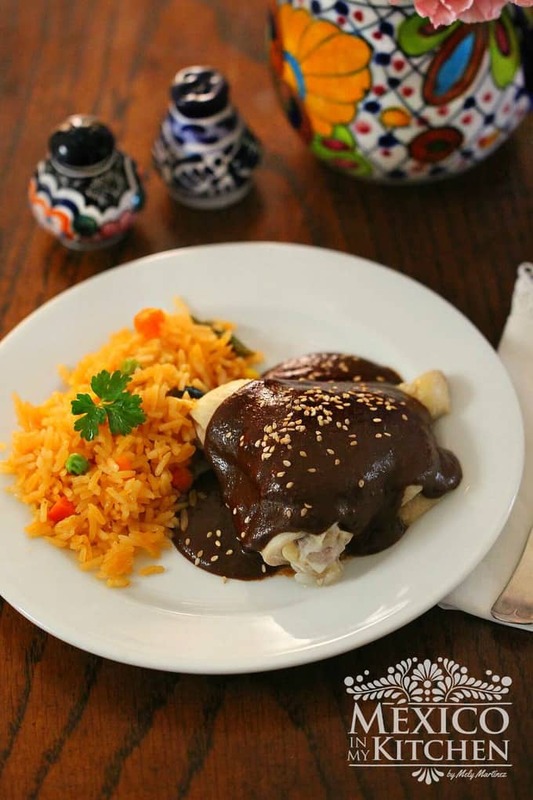 Chicken Veracruz Style a delicious and elegant dish that’s perfect for a nice dinner. Heat the oil in a large frying pan over medium-high heat. Season chicken with salt and pepper. Chicken Stew Veracruz Style 4. Cook the vegetables 2 more minutes after adding the potatoes. Place chopped tomatoes and cup of water into a blender and process until smooth. Pour tomato mixture into the frying pan using a colander or sieve. Add the chicken; bring to a boil and then lower the heat to simmer. Add bay leaves, thyme, marjoram, olives, raisins, and capers. Season with salt and pepper and cover. Simmer until chicken and vegetables are cooked (about 10-12 minutes). The cooking time will vary depending on the size and type of chicken pieces. In the winter time, I make this stew using canned tomatoes instead of fresh. Or, if I’m using fresh tomatoes and they don’t have much juice, I simply add a few teaspoons of tomato paste to the sauce. I know there are many ingredients in this stew, but all of them add up to the richness of its flavor. Some people eliminate the carrots and potatoes, while others add the vegetables available by region or season of the year. Sometimes I even add a little bit of wine and sweet peas too. It is simply a matter of taste. Do you think stews are just for cold winter days? Que rico, lo voy a cocinar hoy! Mi familia siempre lo hacia pero hace mucho que no lo comemos! We do know it as "estofado", thanks!!! Can i add a bit of cumin? This was easy to prepare and it was delicious. My husband couldn’t stop himself and went for thirds. I added red pepper and a chipotle bullion cube, quite nice. Thank you! I made this pollo veracruzano this morning. I used canned tomates because they are not in season now. OMG! This was simply divine. The sauce is so aromatic that I scooped it up and literarily licked the plate. I will definitely try your other recipes. Thanks. It is a nice sauce, this is one of my husband favorite dishes! I was a little unsure about this receipt but I tried it anyways, it was so delicious. Why would I have doubts when everything I cook from your receipts are delicious your receipts never fail!! Thank you!! Thank you for trying the recipe. This is one of my husband favorite recipes. Well, almost any meat cooked Veracruz Style, likes it. I hope you can see the other options here in the blog cooked that way. Will it make a big difference if i leave out the raisins? No, the raisins give it the sweet taste and with all the ingredients mixed up creates a whole rich flavor. But, if you don’t want to use it, the dish will still be great. You often say you sometimes use canned tomatoes in the winter…but you do not give the quantity of canned to.atoed to use in place of fresh. For this recipe you will need 1 can of tomatoes (24 oz) size.